You heard about reactions to mobile phones in 1973? How hilarious that people objected to a piece of technology that has proven to be so useful and effective. We all like to think of ourselves as early adopters. But I am definitely a laggard in some ways. Just as it took me 3 years to get used to skinny jeans, I don’t think the first prototype version of Google Glass is for me just yet. For the last couple of weeks, it forced me to do many things I do not like, such as using an Android phone. When that got stolen yesterday, I was almost relieved, because now I have a good reason not to use Glass for a while. What I liked about Glass was that it was a great conversation piece. I have actually said in an awkward situation: “Let me get a conversation topic” and brought out Glass. I have let people wear it to take pictures and use the navigation. I encouraged them to test if someone other than the bearer can speak commands to Glass (They can. 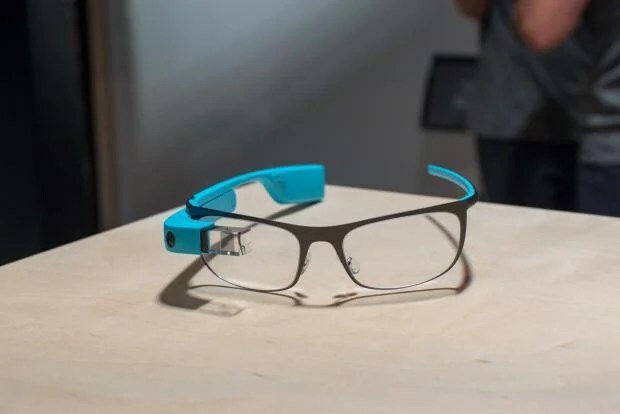 Try it next time you see someone walking around with one: “OK Glass. Take Picture”). It made people happy that they were allowed try it, and that made me happy. What made me unhappy was that I invariably forgot to wear my contacts, and Glass over (non-designated) glasses does not work at all. To get the projected screen in focus, I had to squint. People look funny at you if you are wearing Glass, even at work, even if you work in IT, and even if you are not squinting. I felt especially self-conscious talking to Glass. “Hello people, I’m now going to test something with my Google Glass, please don’t mind me, I’ll be talking but not to you”. I kept my Android phone and Glass together in one place, and whenever I decided to use them, one or the other would have a low battery. It takes Glass forever to power up. It takes very short to drain the battery. The power adapter cord is very short so when you try to charge it while Glass is on your face, you really feel like a dog on a leash. The basic flaws in the hardware of this prototype make it impossible to asses Glass’s value for the kind of ambient user experience I think it is most suited to. To me, Glass seems to work best if its always on, in the periphery of the attention, there to be called upon if there is a need or alert. It would be great if I could decide that I need navigation while I am riding my bike, and at that moment order Glass to show me. Quickly glance at pace and distance while running, without having to fumble with a cell phone. Take a picture in the moment, without having to bring out a camera or phone, switch it on, and so on. Right now, it is just too much of a pain to keep the thing powered up, within range of my phone and on my head. My eyes hurt from the contacts and the squinting and I even acquired a ridiculous hairband to keep my hair off the touchpad. It is possible to have prescription glasses with the functionality of Google Glass, but this only makes me have additional questions. I would be rude if I took out my phone during a conversation, and started reading my email, yes? Would I also be rude if I looked at my Glass? Would I sneak a peek if an alert was showing, even if it was not a good moment? Would this bother me? I am afraid that for me, the answers would be yes, yes and yes. When Glass is on your head all the time, there is no escaping. At CHI 2013, I saw a great talk about the future enslavement of humankind by the Computer Overlords. Hilarious, and a little bit too close to home. I am not afraid of the NSA reading my emails or seeing my pictures. What I am afraid of, is losing touch with real life. With Glass on, you are there physically, but your mind is somewhere else. Immersed in a newsfeed on Glass, you are suffering from inattention blindness the same way people who talk on the phone while driving do. People have worse memory for objects, and for specific object details, when they take photos of them. Perhaps the ideal solution would be to not have Glass on all the time, but, just like sunglasses, only in specific situations. Like sunglasses, you would remove them when speaking to someone. Like sunglasses, Glass would have to be on and usable the very moment you put it on your head. 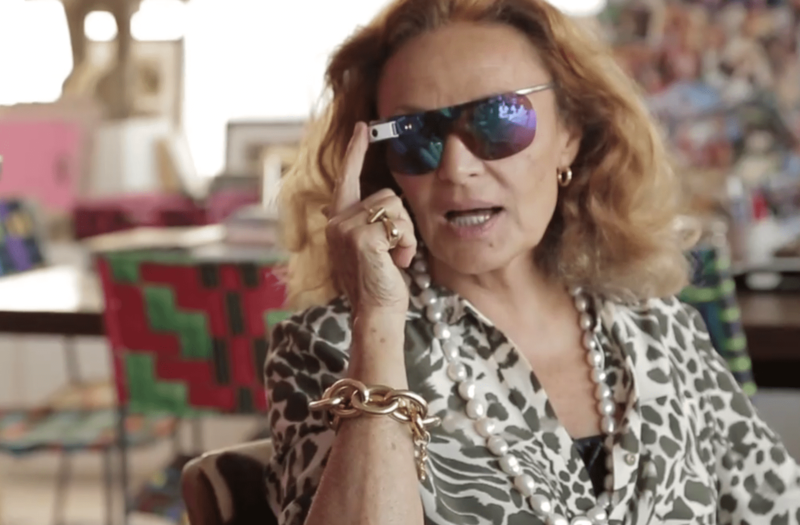 Perhaps combining Glass and sunglasses is the way to go, as Diane von Fürstenberg so elegantly proposed. Today I brought back the Google Glass to the IT Service department, and for the first time in weeks, I do not have the nagging feeling that I should be doing something with Glass. For now, for this laggard, Glass is way too invasive and crude. But I will be thinking about applications for future versions of Glass, that will no doubt be usable, elegant and above all: barely there. This entry was posted in Fontys and tagged ambient intelligence, google glass, peripheral interaction, usability, user experience by Hanna Zoon. Bookmark the permalink.